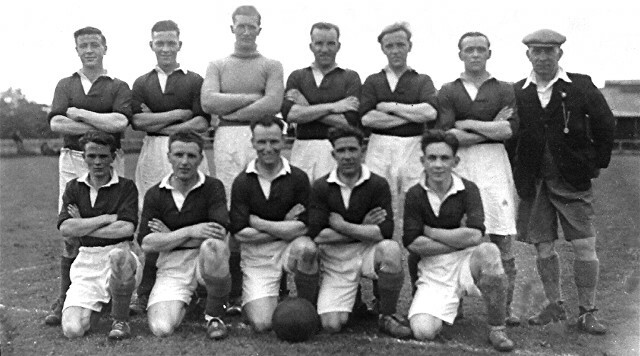 The Invergordon Football Team who played 'Caley' just before the War. The referee is Colin Urquhart. The referee was my grandfather. His son, Colin Urquhart, still lives in Gordon Terrace with his wife Dot and son Ross. Colin and Dot are the only original tenants left in Gordon Terrace. There were two other sons, Donnie Urquhart (joiner), Alex Urquhart (painter), and only sister Chrissie Urquhart. Memories come flying back: Bill Edmeads and I had two things in common, we both played football and piano. One player who made it to the top was Jimmy Andrews - Dundee and West Ham.